John’s Note: Larry Nixon of Bee Branch, Arkansas, began guiding fishermen before he was in high school. 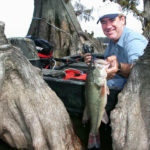 He joined the professional bass fishermen’s ranks about 4 decades ago. Nixon became professional bass fishing’s first $1 million winner and today has earned more than $3 million fishing B.A.S.S. and FLW circuits, not including sponsorship money. He was named B.A.S.S. Angler of the Year twice and won the Bassmasters Classic. 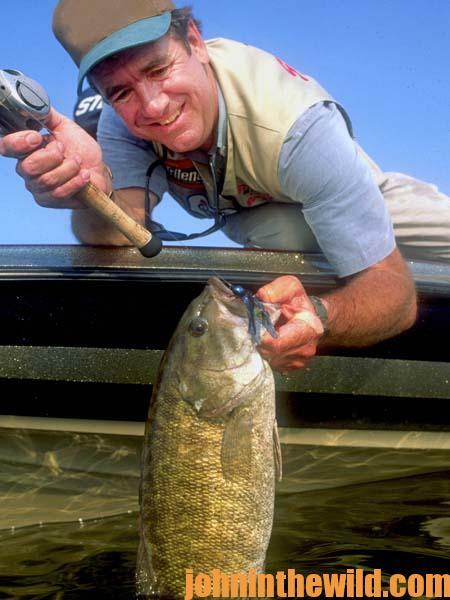 A member of the Arkansas Outdoor Hall of Fame, Nixon, also is one of the most-respected anglers in tournament bass fishing history. Nixon enjoys fishing Pickwick Lake where the borders of Tennessee, Mississippi, and Alabama meet for smallmouths and largemouths in the summer. When he’s not fishing, Nixon can be found deer hunting. On the June afternoon of the awesome morning of smallmouth fishing, Larry Nixon and I found no current pulling through the lake. For the first hour of fishing, neither of us got a bite. “I can’t believe the fish have shut down,” I told Nixon. “But even if we don’t catch a fish this afternoon, we’ve had one of the greatest mornings of fishing I’ve ever had.” But Nixon observed, “Don’t stick a fork in us yet. We’re not done. I believe the fish are going to turn on when the power company starts running current.” Ten minutes later, the water began moving. Nixon increased the power on the trolling motor to keep the nose of the boat headed into the current. On his next cast, Nixon yelled, “There he is.” And immediately a huge smallmouth leaped for the sky. 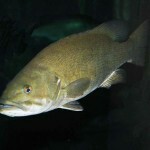 The large smallmouth came out of the water two more times. But with the angling skill that had produced good paydays in every tournament he’s fished, Nixon masterfully played the bronzeback into his waiting hand. 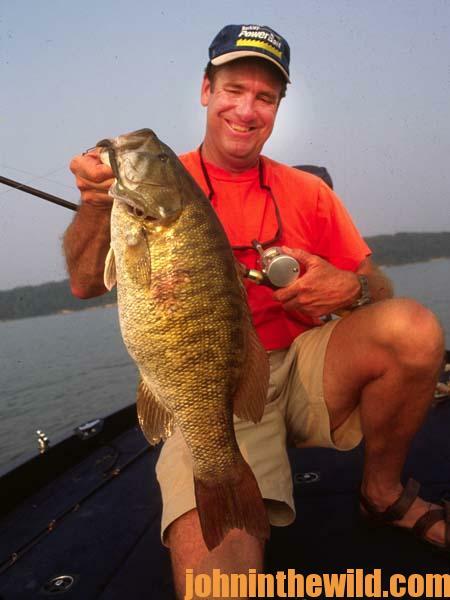 Pulling the fish into the boat, Nixon announced, “That’s one of the biggest smallmouths I’ve ever caught in my life. Cast out there quickly. 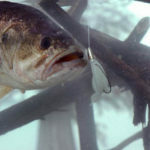 The fish may be turning on.” Nixon took his jig out of the huge smallmouth’s lip. When I brought the fish close to the boat, the giant smallmouth dove for the bottom. Immediately I took my rod tip around the back of the big motor to fight the fish on the opposite side of the boat from where I’d hooked it. Then as the fish turned and started running upstream, Nixon barked out, “Come to the front of the boat! Get up here on the front where you can fight the fish.” By now Nixon had his big smallmouth in the livewell and tried to help me land mine. 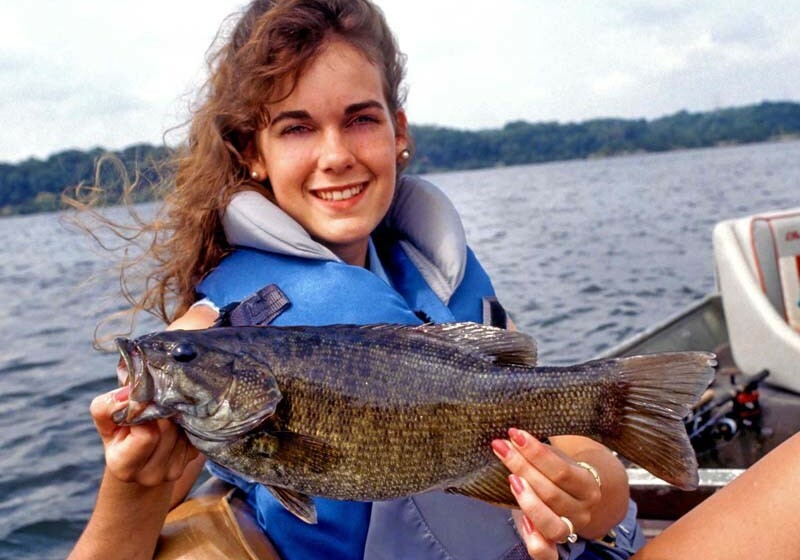 Since I had the biggest smallmouth of my life on the end of the string and one of the world’s greatest bass-fishing professionals in the boat willing and eager to help land the fish, I didn’t let my ego supersede my desire to boat the fish. “He’s coming in Larry, get him,” I said frantically. Nixon’s vice-like grip locked the fish securely in his hand as he brought the trophy into the boat. We photographed and weighed the two fish before releasing them. Nixon’s smallmouth weighed 7 pounds, and mine weighed 6-1/2-pounds. We quickly began fishing again and caught eight more smallmouths, weighing from 3- to 5-pounds each, before darkness enveloped the lake. At supper that night, we both realized we’d had one of the greatest days of smallmouth fishing two anglers ever had experienced. 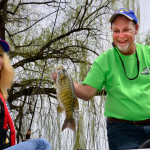 We had boated and fished for a day in smallmouth paradise.